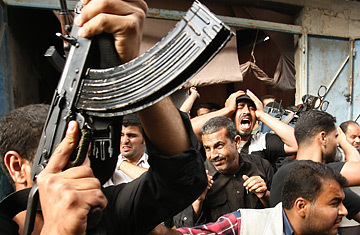 Palestinians react during the funeral of senior al-Aqsa Martyrs Brigades commander Baha Abu Jarad in northern Gaza May 13, 2007. Imposing order on the rival gunmen of Hamas and Fatah would have been a tall order for a leader far stronger than Palestinian Interior Minister Hani Kawasmeh. Kawasmeh, a career civil servant rather than a tough-guy commander of either of the two main Palestinian factions, was appointed to the position as a compromise candidate after Hamas and Fatah brokered their unity government in Mecca earlier this year. And it came as no surprise when he announced his resignation on Monday, amid a fierce resurgence of fighting between the two camps that has claimed at least eight lives since Sunday. Absent a power base of his own, Kawasmeh's prospects for integrating the fighting forces of the rival factions into the Palestinian Authority's security forces were always slim. But his resignation may nonetheless portend the collapse of the unity government, and the onset of a full-blown Palestinian civil war. Kawasmeh's failure results in part from the refusal of Fatah hardliners to cede power within the Palestinian Authority to Hamas, despite the fact that the latter won last year's Palestinian parliamentary elections. Even after their leaders agreed to a power sharing arrangement in Mecca last fall, many Fatah officials have done their best to make it fail  perhaps encouraged by the U.S., which has refused to have any relations with a Palestinian government that includes Hamas, and has made isolating the Islamist ruling party a focus of its Middle East policy. But Hamas has its own hard-liners, who have plenty to gain from the collapse of the unity government. One of the main reasons for sharing power with Fatah  to circumvent the U.S.-led financial siege of the Hamas-led Palestinian Authority  has turned out to be moot. The U.S. and the EU continue to refuse to give direct aid to any Palestinian government with Hamas in it, despite the unity government. A narrower Hamas government would also be in a better position to prevent the already fragile Arab League initiative offering Israel a comprehensive peace agreement in exchange for a returns to 1967 borders. The area evacuated by Israel in 2005 is well on its way to becoming a kind of seaside Falluja, a safe haven and training ground for extremists of all kinds. Aid workers recently returned from Gaza describe a city breaking down into tribal and gang formations, much like Iraq. The fact that these groups can act with impunity is clear in the ongoing captivity of BBC journalist Alan Johnston, who was kidnapped in March, and has been held despite the fact that his release has been demanded by the top leadership of both Fatah and Hamas. Last week, Palestinian President Mahmhoud Abbas said that his security forces are aware of Johnston's location and the identity of his kidnappers, but have been unable to act on that information, ostensibly out of concern for Johnston's safety. Without a government in Gaza, near term prospects for Johnston's return will look even worse.